No. 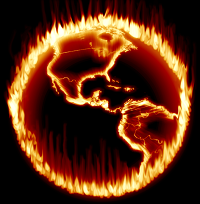 The world is not on fire. This rather striking image is an exaggeration. 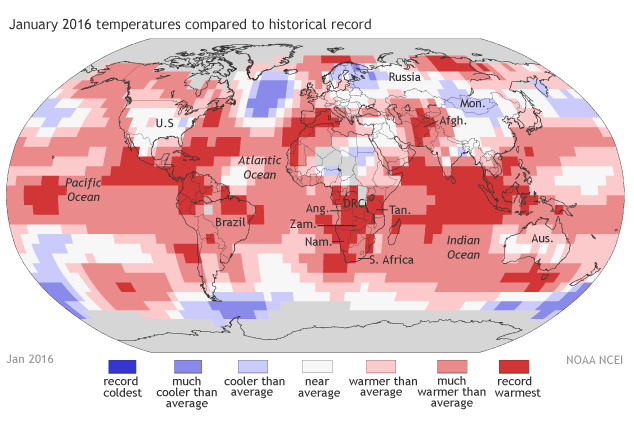 NOAA and NASA held a joint press conference to report that 2016 was the hottest year on record since circa 1880 when surface temperature record keeping around the world began. This is the third year in a row that has set high temperature records! A list of seventeen of the years with the highest average surface temperatures of Earth shows that 16 of them have occurred since the year 2000. "The temperature record is like going up a staircase. Now, with 2015 and 2016 [data], we've seemed to go up another step. We may oscillate around this higher level for a few years, but I don't think we'll ever go back to the values we've seen in previous years." We may not be hearing many statements from either NOAA or NASA in the future. In late 2016-JAN, two days after their joint press conference, Donald Trump took his oath of office as the 45th President of the U.S. He has stated in the past the "alternative fact" 4 that climate change is a hoax created by the Chinese government to create difficulties for American business. In the future, there may not be any NOAA or NASA scientists willing to report on the reality of climate change and thereby threaten their own future employment with the U.S. government. 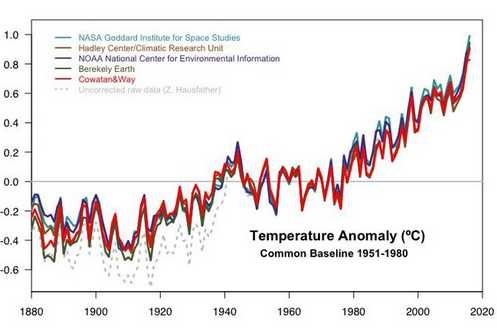 The graph's baseline temperature, shown as the horizontal line marked 0.0 ºC, is the average of temperatures over the interval 1951 to 1980. Image: © Kevin Giszewski. Downloaded from Dreamstime Stock Photos. An "alternative-fact" is false information, divorced from reality, that is intended to spread falehoods and sway opinions. There is only one truth. However, there can be many "alternative-facts."